gas stove, gas stove and a fridge freezer. Our Retro Eriba Triton may have a maximum weight of 1,000 kg. The Eriba Retro Triton from January 2013 may in many cases be drawn with a B license. In this retro Eriba Triton is a double bed of 1.90 x 1.90 meters. Our Retro Eriba Triton has a BOVAG inspection in 2016. - We want to feel that we are going to lend to campers who will go exclusively used for bedding and Eriba as if it was their own property. - Your vehicle must meet the requirements to comfortably pull a loaded Eriba 750 kg. - No smoking in the Eriba caravan. - No pets allowed in the Eriba caravan. - Up to 100 kg of baggage that can be taken in the Eriba; more than enough for a nice holiday! - Unfortunately we can not rent the caravan to young people. - We do not want it cooked in the retro caravan, a new cooker purchased for each vehicle with a matching table. The user must be in possession of a valid driving license B. In addition, an AA Roadside Europe Service + trailer fee required if you are going abroad with HYMER. The Eriba caravan must be clean handed. You check with us up the inventory and return. € 30.00 charged for cleaning. At the inception of the lease is ID required. 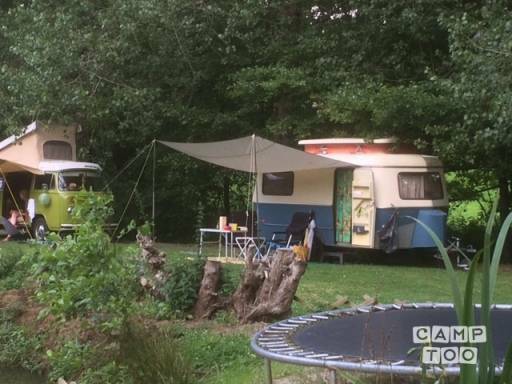 Our caravans can be picked up in Zutphen. This is only on weekdays. You can pick up the caravan in Zutphen at Edwin. Gezellige 2 persoons caravan met keukentje, toilet, groot bed en fietsenrek.